Water filters will usually work without any problems for many years on end, especially if you observe the maintenance requirements laid down by the manufacturer. Periodic maintenance is a key factor in ensuring that your water filter is in top shape and does what it’s supposed to – remove contaminants to the best of its abilities. Failing to replace your water filter system’s filter cartridges can lead to a series of water filter malfunctions and can potentially endanger the health of your family since your filter will no longer be able to remove contaminants, or even worse, contaminants trapped in the filter cartridge can wash back into your drinking water. Most water filter issues will usually appear when the water filter system is not regularly maintained or not maintained at all. But lack of maintenance is not the only factor that can interfere with the faultless operation of your water filter – a filter and water type mismatch can also cause water filter operation issues. What is Soft Water and Should You be Drinking it? Soft Water – Is it Safe to Drink? As opposed to hard water that is high in calcium and magnesium, soft water is low in water hardness causing minerals. Neither calcium nor magnesium are unhealthy for you, however, high levels of these minerals can cause trouble when it comes to the health of your home appliances. Not only that hard water is not gentle on your appliances, it can also dry your skin and hair. Water in the United Kingdom is predominantly hard, which is why a water softener is often found in the households of most homeowners. Water softeners treat hard water to produce soft water. So, how is soft water better than hard water, and should you be drinking soft water? Each summer, hydration is a buzzword that you cannot escape. All health diets, public service announcements, online health magazines advocate for more water consumption, but few deal with the type of water you should be drinking. So, what is the best water to drink when there are so many variants to choose from – bottled, carbonated, tap, filtered or even more exotic options like coconut water? In our quest to find the best water to drink, we are going to analyse the different options available to consumers and the pros and cons of each. We will start with the most obvious choice many of us make – bottled water. Easiest Ways to Filter Water at Home! Store-bought filtered tap water? Forget about it! There are cheaper and easier ways to get filtered water at home. Learn about the easiest ways to filter water at home, and ditch expensive bottled water for filtered tap water. While drinking tap water may not sound appealing, there are many advantages to switching to tap water, beyond the obvious financial benefits. And when it’s filtered, there are simply no disadvantages to worry about. In this article, we deal with the simplest and easiest way to get filtered water at home, directly from the tap. 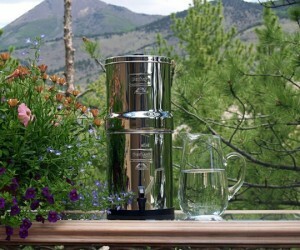 Gravity Water Filters – Let Gravity Help You Filter Water Wherever You Go! What do water filters have to do with gravity? Gravity water filters or gravity fed water filters rely on the force of gravity to allow water to pass through a filter bed, thus, cleaning water like a regular water filter, but without any water pressure or electricity. These types of filters come with a great deal of independence – you don’t have to plumb them in, you don’t need any municipal water pressure or any source of electricity, and you can take them with you anywhere you go. While most water filters are pressure-based, gravity water filters don’t need pressure to filter water. The porous structure of ceramic filters and carbon filters allow water to pass through all the while trapping harmful contaminants. Albeit this process is much slower than pressure based systems, it’s not less effective at removing contaminants. Gravity water filters are used with great success in emergency relief situations, precisely because of their easy usage and high contaminant removal capacity. Going on an adventure in the great outdoors? 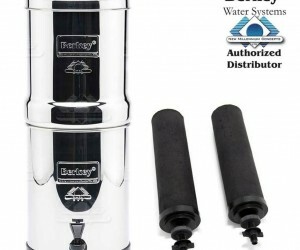 Make sure to take a Berkey water filter with you for quality filtered water whatever the source – spring, river, lake, pond or other natural resource you must rely on when you go off the map. Berkey water filters are a reliable water filter even in hostile environments, where there is no running water, electricity, or in countries with substandard water regulations. These filters are called gravity water filters, since they rely on the force of gravity to filter water and not on the pressure of incoming municipal water as is the case with most plumbed-in water filters. Let’s see how the Berkey water filter works, which are its filtering capabilities, and why is it the ultimate water filter for backpackers? Taste and odour filters are designed to target contaminants in tap water that alter the palatability of tap water, conferring it and often strange taste and odour. These filters are usually carbon-based, that is, they contain various combinations of activated carbon, which is one of the best filter media for improving tap water’s taste. The most common complaint raised with respect to tap water is its strange taste and odour. In fact, many homeowners would gladly switch from bottled water to tap if not for the peculiar smell and taste of tap water. Thankfully, most residential water filters, whether under-sink filters or whole house filters, are designed to also improve the taste of municipal water, beyond their contaminant removal capacity. What causes tap water to smell or taste bad? What can you do to get rid of taste and odour problems? 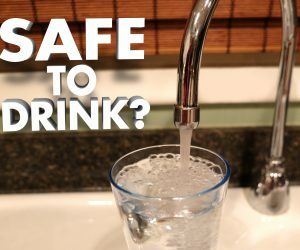 Let’s see which are the best ways to get better-tasting tap water in your home. What are 3-way kitchen taps? 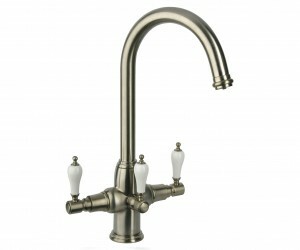 3-way kitchen taps are a subset of water filter taps that are used together with under-sink water filters. 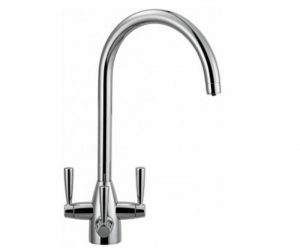 Standard water filter taps dispense filtered water only and are placed adjacent to your existing kitchen taps. In contrast, 3-way kitchen taps replace your existing kitchen tap, and they combine the functionality of your regular kitchen tap with that of a standard water filter tap. The result? 3-way kitchen taps dispense filtered cold water, unfiltered hot water, and unfiltered cold water from a single tap, hence the name 3-way taps. While standard filter taps are installed on your kitchen sink by drilling another hole in it, 3-way triflow kitchen taps replace your regular kitchen tap. Our complete guide to 3-way kitchen taps will get you up to speed with everything you need to know about 3-way kitchen taps, including their types, advantages, disadvantages, and things to consider when choosing one for your kitchen. Water filter maintenance is the only way to ensure a continuous supply of quality filtered water in your home. Some water filters are easier to maintain, others are more difficult. The key is to know beforehand the maintenance requirements of your water filter system. Generally, a water filter for domestic use is not dependent on ongoing maintenance, nevertheless, some level of periodic maintenance is required by most water filters, regardless of their type. 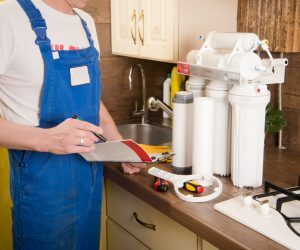 Whether you own a reverse osmosis filter system or an ultraviolet water filter, filter cleaning and filter replacement are two of the most common maintenance tasks you need to carry out to ensure that your water filter is in top shape and operating at peak performance. Water Filter Kits – A Quick Solution for Filtered Water in Your Kitchen! Sometimes finding the right filter to go with the right kitchen tap can be a daunting task. There are compatibility issues, filter performance, water filter tap functionality, space and aesthetics to consider. Water filter kits are an all-in-one solution that ease the process of finding the right under-sink water filter for your kitchen. 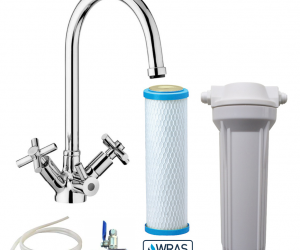 There are various filter kits available on the market, the most complex ones being those that contain all that’s necessary for a complete filter system for your kitchen: filter housing with filter cartridge, water filter taps and all tools or parts needed for installation including a DIY installation guide. Water filter kits have several benefits – some financial, some practical – over having to buy filters and taps separately. We will go into the details of why water filter kits may be a good solution to filtering tap water in your kitchen, and what are the potential downsides of buying a water filter kit instead of choosing and buying each item separately. Water Filter Taps – Types, Features, and Finding the Best! Water filter taps are a special kind of tap designed for the dispensing of filtered water. Depending on their type – single dispensing water filter taps or 3-way kitchen taps – water filter taps are installed either next to your existing kitchen tap or they replace your existing kitchen tap. These water filter taps are unique to under-sink water filters, which require an additional tap for filtered water or separate waterways to avoid mixing unfiltered tap water with filtered water. In this article, we’ll present both types of water filter taps highlighting the features, benefits and drawbacks of each as well as some tips on how to find the best water filter tap for you.